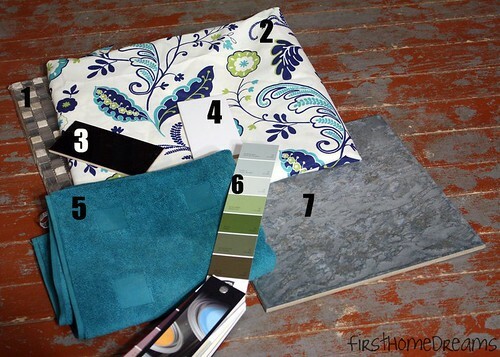 First Home Dreams: Bathroom Update - We bought tile! Bathroom Update - We bought tile! Although we still don't have a time frame for when we'll actually start the bathroom overhaul, we've finally made a little bit more progress. You can read previous bathroom-centric posts here and here. We bought tile! Floor tile. We also made decisions on our wall tile. Here's a shot to give you an idea of our colour scheme. Isn't our living room floor lovely? Or something. Let's go through this stuff item by item. 1. Neutral mosaic tile. We knew we wanted to add in a little something to the tile wall to make it stand out, but this stuff can get crazy expensive. This particular mosaic was $14.99 a sheet, and they pretty much go up from there. To keep our budget in check, we're working with just three sheets. More on how that's going down closer to go-time. 2. Bright fabric shades. This is the fabric that our bathroom DIY no sew roman shades are made of. The window is big, at 32" wide by 60" tall, so the fabric has a pretty significant impact on the room - especially since they're always all the way down because of the position of the window. 3. Black subway tile. To break up the wall of white that will be the tile wall, we're incorporating bands of black subway tile. This stuff rings in at just 21 cents a tile at Rona (compared to 32 cents at Home Depot). We love purchasing from Canadian companies! 4. White subway tile. This will be the mainstay of the tile wall. It's clean, classic, and very appropriate for an old house. Because it's ceramic, just like the black tile, it's just 21 cents from Rona. 5. Turquoise bath mat. We went to Ikea a few weekends ago, and this is one of the few items that I bought. I love the bright colour, and for just $6.99, it was a no brainer. 6. Grey paint. The paint chip shown is Benjamin Moore's Wispy Gray (from 2004), which we'll have colour matched to Behr's Premium Ultra Plus (paint and primer in one, which hopefully comes in a kitchen and bath formula). It's actually a little bit more grey in real life as opposed to how it's showing in the picture. 7. Blue/grey floor tile. I've mentioned a couple times around here that we had our hearts set on a dark grey tile. But, they never seemed to go on sale, and were anywhere from $3/sq ft and up. We're working with 93 sq ft of space in the bathroom (plus you always have to buy at least 10% extra, at the very least), and we just aren't able to spend that kind of money. This past week, the Rona flyer was advertising these blue/grey tiles at $1.79/sq ft. We went in to check them out, and were happy to see that they were marked in store even lower, at $1.52! I probably stared at them for 5 minutes before I sorta okayed them. Then we brought over the other tiles to see how they'd work, and I was satisfied that I wasn't going to have a blue ocean-esque bathroom. We'll use a dark grey grout with them rather than a white to hopefully bring out the greyness rather than the blueness. Our vision of the bathroom has changed a lot since we moved in (see here and here). It's a good thing we're taking our time - otherwise we'd have a space that we weren't head over heels for. What do you think? I'd love to hear it.